One way to produce more and cheaper energy ensuring continuity lies in combining wind and solar energy on a device. These wind turbines shaped as “flying saucers” are already being sold in Spain. It is revolutionary technology that allows greater deployment of renewable energy sources in urban areas and the recharging of electric cars. It is a starting point for wind energy to begin invading urban spaces. This device, which incorporates the Omniflow technology, patented and supported by the European Union, is applicable to residential and commercial areas. 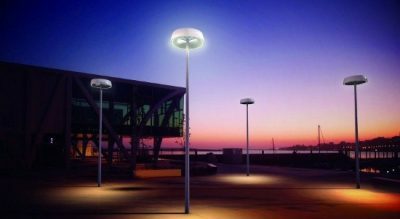 The Omniflow technology for street lighting application is called OmniLED and is an independent fully autonomous intelligent lighting system. 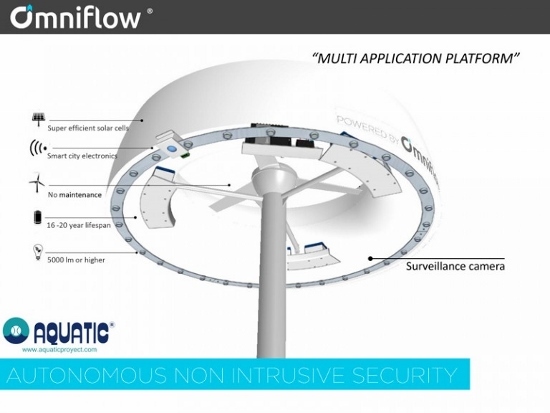 “Omniflow and OmniLED, are efficient, practical and aesthetic solutions that protect the environment by generating solutions to address domestic and public problems: power generation, lighting, 360º surveillance, Wifi recharge, and mobile and electric vehicles recharge… These are everyday needs that these devices can meet with zero maintenance cost and consumption. We give solutions wherever there is no network,” says to Energynews Jorge Pozo Alonso, responsible for Business Expansion and Development Aquatic the company distributing the Omniflow technology exclusively in Spain. This technology has just landed in Spain but there are already facilities operating in the City of Yonkers or the Hudson River, in the United States or in Shanghai and Morocco. The blades are modular and are arranged in a wing form allowing harness the wind that comes from any direction. This improves the use of horizontal axis wind turbines, which in spite of having pitching mechanisms to change orientation depending on the wind direction, do not work properly in turbulent urban conditions. The blades are integrated on a mast whose size can vary depending on the site of installation. Photovoltaic cells cover the surface of the device. At its center a vertical axis turbine rotates capturing and accelerating wind coming from any direction. It also harnesses the air passing above, which is combined with that coming from the turbine thereby generating a helical flow. Its batteries withstand up to seven days under unfavorable sun and wind conditions. As it combines wind and solar energy, it limits the discharge cycles of the battery using complementary energy sources so no need for large storage settings. In addition to helping reduce energy bills by its high efficiency and use of renewable sources, this technology is highly compatible with cities for its low noise and vibration levels. Its suitability for residential areas lies in the fact it can be placed both on the floor and ceiling. In addition, both the color and decoration of the turbine can be “customized”, for example with a logo. It also incorporates a protection diffuser that makes it bird friendly.